Place the fillets onto a greased grill pan and brush with the olive oil. Season and cook for 2-3 minutes under a moderate heat. In a small bowl mix together orange rind and low fat soft cheese. Spread over the fish fillets. Return to the grill and continue to cook for a further 4-5 minutes. To make the sauce: place the creme fraiche and orange rind and juice into a pan. Heat gently for 3-4 minutes, season and add the chopped chives. 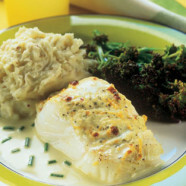 Serve the fish and sauce with mashed potatoes and broccoli.